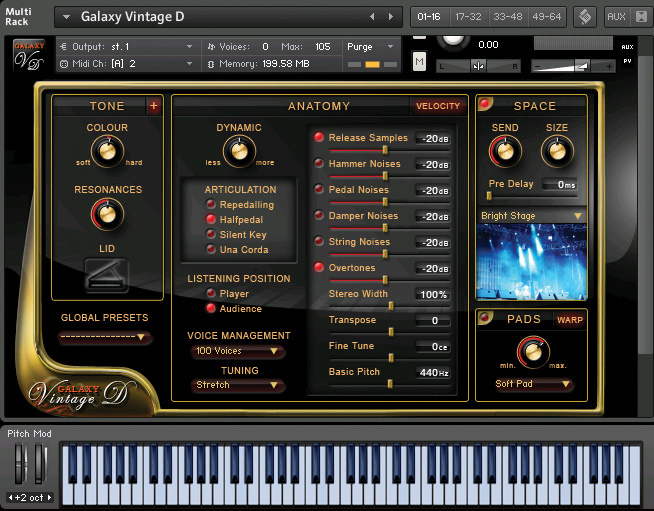 Galaxy's new star expands the sampled piano universe. The Galaxy range of pianos made its debut a few years back with Galaxy Steinway 5.1, a surround‑ready sampled grand recorded at (you guessed it) Galaxy Studios in Belgium. (You can read the Sound On Sound March 2006 review at /sos/mar06/articles/sampleshop.htm.) That project was a collaboration between veteran German sound company Best Service and producer/engineer/programmer Uli Baronowsky. A year or so later Baronowsky (now operating under the name of Galaxy Instruments) and Best Service teamed up again to release Galaxy II, a three‑piano package which added a Bösendorfer Imperial 290 and a Blüthner baby grand to the original Steinway 5.1. Galaxy Instruments now have a new star in their sky — the Galaxy Vintage D, a 1920 Steinway D274 piano housed in Germany's Bauer Studios. The list of pianists who have played this venerable grand includes such luminaries as Keith Jarrett, Chick Corea, Joe Sample, Abdullah Ibrahim, Carla Bley, Ralph Towner and Richie Beirach, who called it "the best piano in the world”. Musicians of this calibre would not put up with a second‑rate instrument, and the letters of thanks written to the Ludwigsburg studio by Messrs Jarrett and Corea tell their own story. Jazz pianist Tobias Dehler was hired for the sampling session and spent five long days performing approximately 2100 samples — an unprecedented example of a jazz player sticking to a simple chart. The Steinway D concert grand is one of the world's most famous and distinguished pianos, with a large (almost nine foot) frame creating a rich, deep sound that smaller instruments can't emulate. The model sampled here was built 90 years ago in Steinway's Hamburg factory and has allegedly been kept in perfect condition by Bauer Studios' owners. Various mics (including Neumann U47 and KM53 valve microphones) and vintage Neve and Telefunken preamps were used for the recording, after which the samples were created by blending the mic signals with no EQ or compression, paying particular attention to phase coherence. Unlike the original Galaxy Steinway 5.1, this piano does not have built-in surround capability, and there are no microphone position variants: its 24‑bit, chromatically mapped stereo samples were all recorded from one perspective in a studio acoustic. 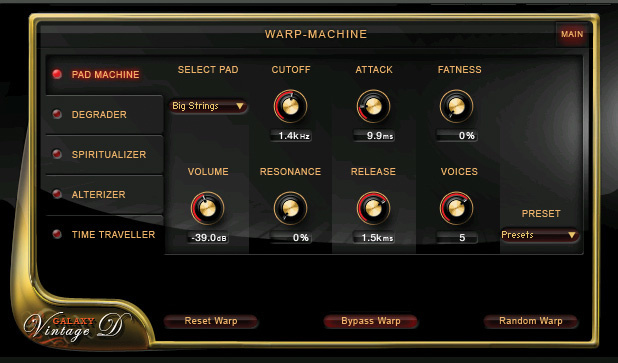 Controls for the layered pads and effects are grouped together on one 'warp' screen. Unsurprisingly, this 'keep‑it‑real' recording approach has resulted in a satisfyingly naturalistic tone; the Steinway D combines size, warmth, luxury and a powerful bass with a crystal-clear top end, and its transparent, uncoloured sound will lend itself to a variety of playing styles. Thirteen velocity layers ensure there's enough dynamic subtlety to satisfy jazz pianists and solo balladeers, and there's also enough force and hardness in the louder samples to cut it in rock and pop arrangements. Any concert pianist brave enough to try an electronic instrument will find it perfectly suitable for classical repertoire. At the other end of the spectrum, my rock background disposes me towards a fairly bright piano tone and I found the sound of the basic preset to be a touch too mellow. However, a small increment of the instrument's soft‑hard tone control added the hint of extra brightness I was looking for. Should you need something more radical, the tone control's sub‑menu has three‑way EQ and an extremely potent compressor. The dynamic response is aided by some clever and subtle scripting, courtesy of programmer Klaus Baetz: each of the 13 velocity zones has a filter which becomes active only at the lower end of the zone. The softening of the quieter notes within each velocity range helps soften the transition to the zone below — you can't really hear it working, but the absence of any tonal 'stepping' as you play at different dynamics is a testimony to its effectiveness. 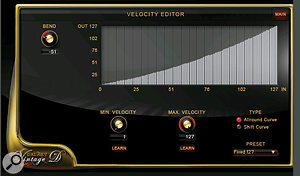 Dynamic controls are provided to help tailor the piano to your touch — a simple 'less/more' control compresses or expands the dynamic range, and an elaborate velocity editor allows you to draw in your own velocity curves. You can even make all notes belt out at velocity 127 regardless of how loud or soft you play — a pop producer once did that to a sampled piano I was playing on a session, and I still haven't quite gotten over it. It's interesting to compare this piano to the original Galaxy 5.1 — the new instrument's tone is a touch warmer and its overall sound somewhat more expansive and lyrical. The Vintage D's basic preset has a narrower stereo image than the 5.1, but its stereo width can be increased with an on‑screen control. A choice of 'player' and 'audience' listening positions might suggest that different mic positions were employed after all, but this is not the case: the latter simply swaps the left and right sides of the samples! A built‑in convolution reverb allows the non‑reverberant studio acoustic to be transformed to that of a concert or chamber hall, stadium, cathedral, jazz club or the Taj Mahal (well, why not?). I particularly enjoyed the 'bright stage' setting, a floaty reverb which produces luxurious, transparent trails. The Vintage D's Tone sub‑menu combines three‑way EQ, a muscular compressor and a volume setting for the low keys. A clutch of faders on the main screen give users complete control over the small noises that accompany piano performance: hammers returning to their resting positions, low‑frequency resonance triggered by pedal presses, the subliminal 'pfaff' of dampers lifting from the strings when the sustain pedal is pressed, and so on. Usually regarded as extraneous by recording engineers, these tiny sounds are designed to add realism and have been very carefully sampled. Personally, since they don't contribute anything musical, I'd be happy to keep them all turned off, but they're there if you need them! Another subtle touch is the provision of string overtones, which are samples of the sympathetic ringing of an open string when another note is played. (This is most evident when the second note has a strong pitch relationship with the first, as in an octave or fifth interval.) This effect does have musical value, introducing a sense of the hazy cloud of harmonics that builds up when multiple piano notes are sustained. Release samples do their usual trick of enhancing the realism of note‑offs — you can turn them off if you wish, but they're beautifully programmed and never sound obtrusive. 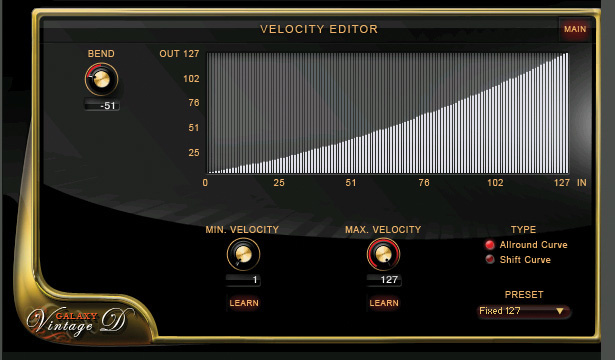 You can draw your own custom velocity curves with this graphic editor. Rather than giving users a large menu of Kontakt instruments to wade through, Galaxy Instruments supply just one instrument which contains all the variants of sound you're likely to need, including patches optimised for jazz and pop. But that's not the end of the story; there's also a menu of pad sounds, some of them radically transformative. We all admired, did we not, the impressive piano‑and‑strings combination emanating from Elton John's expensive Disklavier grand piano in his moving adaptation of 'Candle In The Wind' at Princess Diana's funeral? OK, bad example, but if you're in the market for something similar, the usual suspects of strings, flutes, choir and glassy chimes are available for layering. These may not be the best pads known to mankind, but I enjoyed improvising with them, and found that judicious use of the filter cutoff improved their sound. 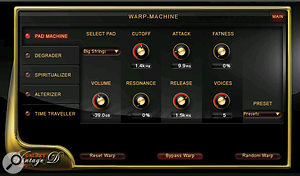 The 'Warp Machine' effects section is a blast, not least because of the daft names it uses: 'Degrader' produces Trent Reznor‑style shredding distortion and its 'sharpness' and pitch‑shift controls can be used to create deranged ring‑modulation effects. The 'Spiritualizer' phaser/flanger sounds delightfully lush and retro, while the award for funniest name has to go to the 'Alterizer', which creates some fabulous morphing effects, the standout for me being the beautiful 'Like Chimes'. There's also a stereo delay with nice long repeats. In the last 10 years we've advanced from judging sampled pianos purely on technical merit to making artistic choices based on the instrument's musical character. No two grand pianos sound exactly the same, and although you'll find other sampled Steinway Ds on the market, you won't find one that matches the character of the Galaxy Vintage D. Ultimately, as I've said before, piano sound is a personal choice which should be based on playing style, musical context and a clear idea of the kind of piano sound you're looking for. If you're unsure, there are plenty of demos on Galaxy Instruments' web site which might help you make up your mind. For my part, though I freely admit I'd always rather play the real thing, I found nothing to criticise in this instrument and would recommend it as a very fine‑sounding, playable and adaptable sampled piano. Sample library producers just lurve the Steinway model D grand piano. Currently on offer are Gary Garritan's Authorized Steinway Virtual Concert Grand Piano (available in basic and professional versions), SampleTekk's Black Grand and Post Musical Instruments' Grandioso Steinway D. PMI also have 'The Old Lady', a 1923 Steinway Model D. Alternatively, if you want to splash out for a multi‑piano package, Synthogy's Ivory, Ultimate Sound Bank's Grand Piano Collection, Native Instruments' Classic Piano Collection and EastWest's massive Quantum Leap Pianos all include a Steinway D.
In Galaxy Vintage D, as with its forerunner Galaxy Steinway 5.1, the effect of the sustain pedal is simulated by the provision of a 'resonance' sample (consisting of the sympathetic overtones of other undamped strings) for each note. The resonance samples kick in when you press the sustain pedal, producing a pleasant wash that's not a million miles away from the effect of a real‑life sustain pedal. A set of real una corda ('one string', aka soft pedal) samples is also provided, switchable on the front panel. Three somewhat arcane pedalling techniques are also included: sostenuto (the mysterious third pedal found on some grand pianos which causes any notes you're holding down when it's pressed to go on ringing while subsequent notes are damped), half‑pedalling (pressing the sustain pedal halfway to produce a semi‑undamped effect — this requires a special 'continuous sustain pedal' capable of outputting MIDI values 1 to 127) and re‑pedalling, where you 'catch' the outgoing decay of (say) a bass note with the sustain pedal after releasing the key, thereby sustaining that note while you move your hands to a new position. 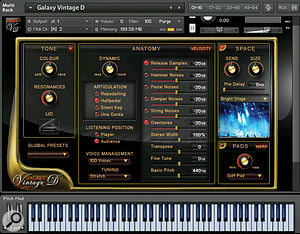 Galaxy Vintage D runs stand‑alone or as a VST, Audio Units or RTAS plug‑in on Mac OS 10.5 'Leopard' or higher and Windows XP/Vista/7. It runs only on Kontakt 4 and Kontakt Player 4 (earlier versions of Kontakt can't load it) and it will therefore not work with pre‑Intel Macs. The minimum system requirements are 1GB of RAM (2GB recommended); the 11GB sample pool has been losslessly compressed and requires only 5.02GB of disk space. Kontakt Player 4 software is included on the DVD, but if you already have Kontakt 4 on your system the Player 4 software will not install — this shouldn't cause any hardship, since all the Player 4's functions are already included in Kontakt 4's software. No dongle or USB key is required — activation of the library is done at Native Instruments' web site using the supplied serial number. To make this easy, NI supply an application called 'Service Center' (sic) which guides you directly to their product activation page, where you can also find updates for NI products. A very fine‑sounding Steinway piano, superbly sampled au naturel. Very playable and stylistically versatile. A good effects menu includes some radical options. Will produce deep feelings of resentment in keyboard players who wished they owned the real thing. Galaxy Vintage D is, in a nutshell, a classic Steinway piano favoured by leading players, recorded with great equipment in a top studio by an experienced and technically skilled production team. It requires no maintenance or tuning, weighs next to nothing, takes up no room space and with a little care will last a lifetime — not a bad deal for an instrument which costs less than £120$150! Best Service +49 89 345 026.